The BookNest.eu blog announced the winners of the 2018 BookNest Fantasy Awards on November 1. AWARDS PROCESS. 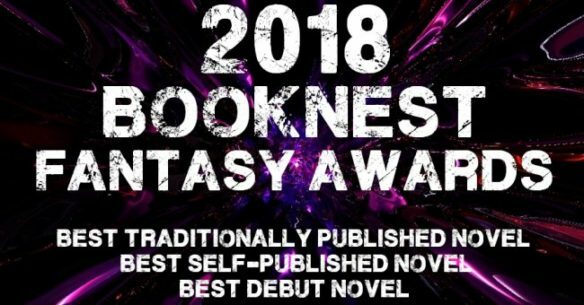 The BookNest Fantasy Awards are selected by a hybrid process — part jury, part popular vote, with a final sanity check on the winners. The longlist was created with the input of nine popular Fantasy Blogs (Bookworm Blues, Fantasy Book Critic, Fantasy Book Review, Fantasy-Faction, Grimdark Magazine, The Fantasy Hive, The Fantasy Inn, The Grim Tidings Podcast & The Weatherwax Report), three big Fantasy Imprints (Gollancz, Harper Voyager & Orbit), and two well-respected Agents (John Jarrold & Joshua Bilmes of JABberwocky Literary Agency). They nominated their favorite books in the first three categories (Best Traditionally Published Novel, Best Self-Published Novel, and Best Debut Novel), published between October 1st 2017 and September 30th 2018. In the second stage and with the public’s help, the 10 books and five 5 imprints with the highest number of votes in each category made it to the shortlist. The winners were chosen by a public vote that ended yesterday. This entry was posted in Awards and tagged BookNest Fantasy Awards by Mike Glyer. Bookmark the permalink. Congrats to the winners. I’ve heard nothing but good things about all three novels.